HSSC Constable (Female) Final Result 2019 Check Here. HSSC Constable (Male) Final Result 2019 Check Here. HSSC Constable (Female) Result 2019 Check Here. HSSC Constable (Male) Result 2019 Check Here. HSSC SI Result 2019 Server II Male Check Here. HSSC SI Sub Inspector Result 2019 Server II Female Check Here. HSSC SI Sub Inspector Result 2019 Server I Male Check Here. HSSC SI Sub Inspector Result 2019 Server I Female Check Here. HSSC Constanle Final Answer Key 2019 Check Here Male/ Female. HSSC Constable Morning Answer Key Check Here. HSSC Constable Evening Answer Key Check Here. HSSC Constable / SI Physical Exam Schedule Check Here. HSSC Constable and SI Admit Card 2018. HSSC Notification is out. 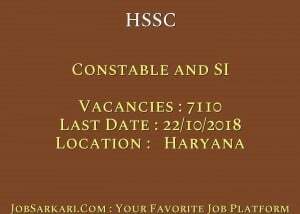 HSSC is recruiting for 7110 Constable 2019 Female Final Posts. 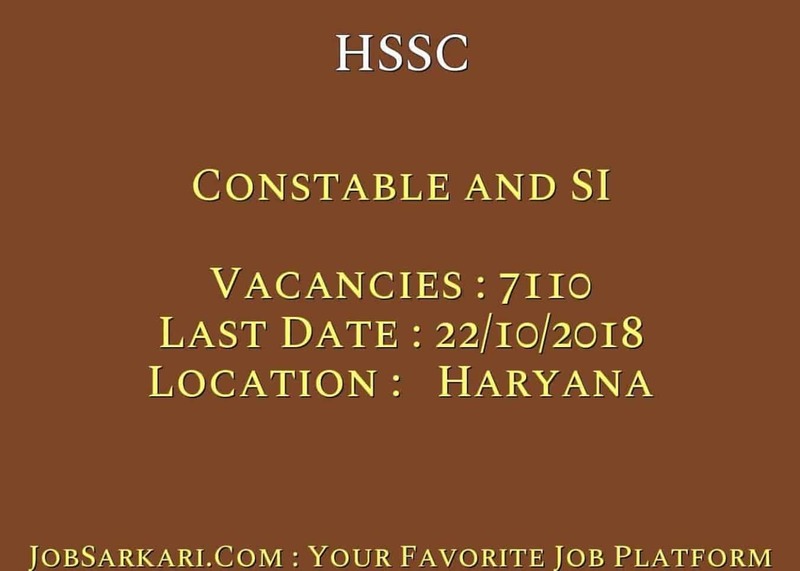 You can check HSSC - Haryana Staff Selection Commission last date, download HSSC notification, visit HSSC official website and check other HSSC Vacancy details.Complete Vacancy and recruitment Details about 7110 Constable 2019 Female Final vacancies in HSSC are provided below by JobSarkari.Com only for you. Date of Re Open Form. 16/10/2018 to 22/10/2018. Last Date for Payment of fee 30/05/2018. Constable Male General Category - Rs.100/-. Constable female General Category - Rs.50/-. Sub Inspector Male General Category - Rs.150/-. Sub Inspector female General Category - Rs.75/-. Mode of Payment Application fee Can be Submitted through Online Mode Using Debit Card, Credit Card and Net banking or Offline through E-Challan Making Payment at Any Branch of SBI Bank. Constable Candidate Must Have Passed Class 12th. Sub Inspector Candidate Must Have Passed Graduation in Any Stream. Constable 18 Years. 25 Years. Sub Inspector 18 Years. 27 Years. Unreserved Male 170 cms 83 cms after Expansion 87 cms. Reserved Male 168 81 cms after Expansion 85 cms. Unreserved Female 158 cms N.A. Reserved female 156 cms. N.A. Male 2.5 Kilometer 12 Minutes. Ex-Servicemen 1.0 Kilometer 05 Minutes. 7.Online Application can be Submitted On or Before 22nd October 2018. Q. What is the Last Date For HSSC Constable 2019 Female Final Vacancy ? A. Last Date for HSSC Constable 2019 Female Final Posts is 22/10/2018. Q. What is the Form Type of HSSC Constable 2019 Female Final Recruitment ? A. The Form Type for HSSC Constable 2019 Female Final Posts is Online. Q. How many vacancies are available in Haryana Staff Selection Commission Constable 2019 Female Final Posts ? A. There are about 7110 Vacancies in Haryana Staff Selection Commission Constable 2019 Female Final Posts.